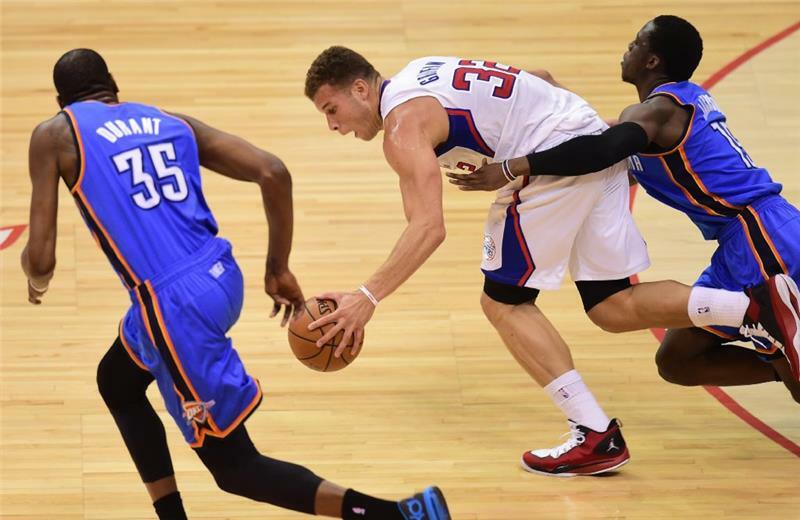 Blake Griffin gets past Serge Ibaka to score in the first quarter of Game 6. Derek Fisher is giving OKC an unexpected lift. Still, in the long run, LA is much better off having him get hot than either of the Big 2.... LA's offense is struggling with the second unit a bit. A lot of outside shots, very little penetration right now. From both teams. 8:33 2Q: #Clippers 35, Thunder 23. 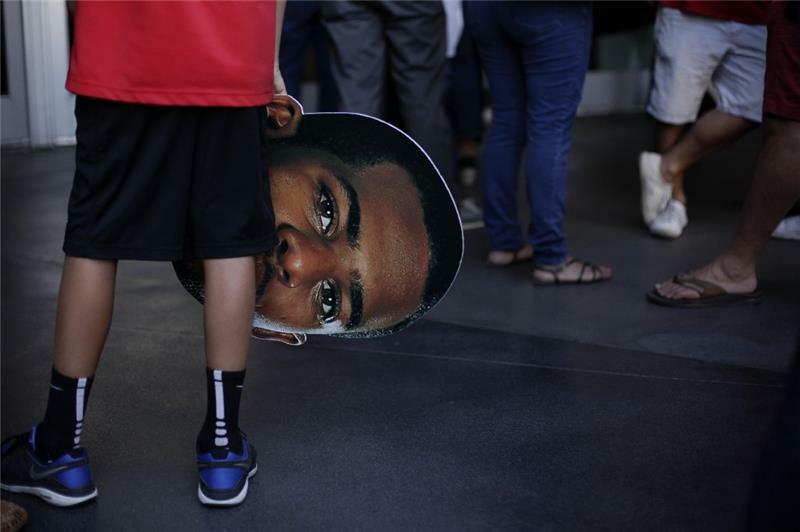 A young fan holds a picture of Chris Paul outside Staples Center. A lot of players for OKC have 2 fouls huh? Great move by Collison to push the lead to 16. They hadn't been effective inside till that floater. Derek Fisher has made his quota of shots for the series. Time to stop shooting. They just showed Jack Nicholson on the jumbotron. Welcome to the other side, my friend. 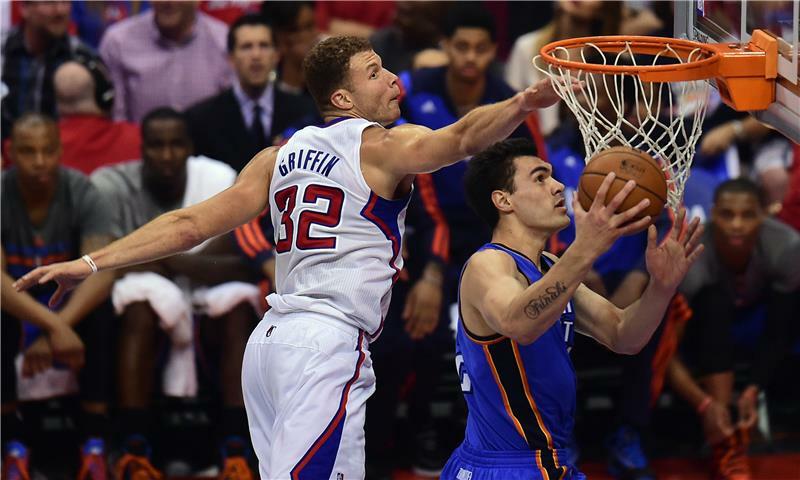 Blake Griffin vs. Steven Adams: a lot of brawn at the basket. Big difference in tonight's game: The Thunder have only been sent to the free throw line 4 times. The Clippers are playing very smart defense tonight. How could anyone boo Jack Nicholson? Durant just made a three-pointer. He's 2-for-3 from the three-point-line tonight, but an overall unimpressive 3-for-9 from the field. 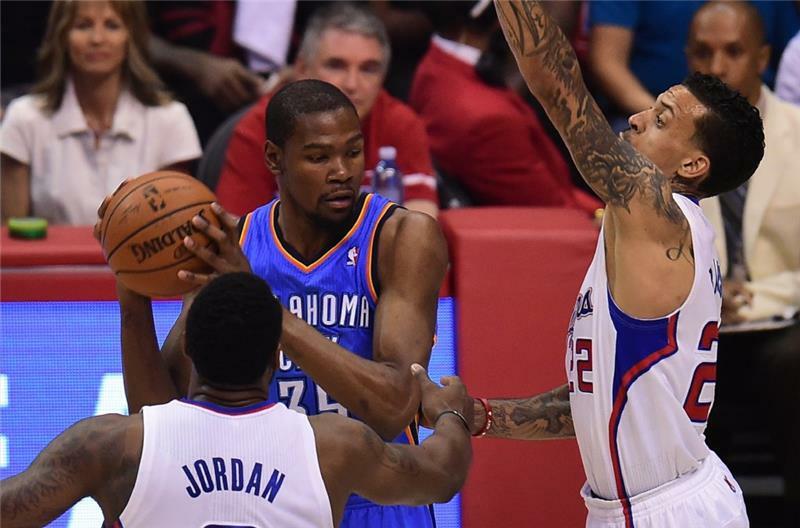 Jeff Van Gundy: Memo to all Clippers: Do not leave the MVP alone. Good advice. OKC's 10-2 run, with consecutive threes, buts the lead from 16 to 8. You know that was coming at some point. Doc Rivers calls a timeout. Clippers 41, Thunder 33 with 5:18 left in first half. @mike: I hate it when leads are but. 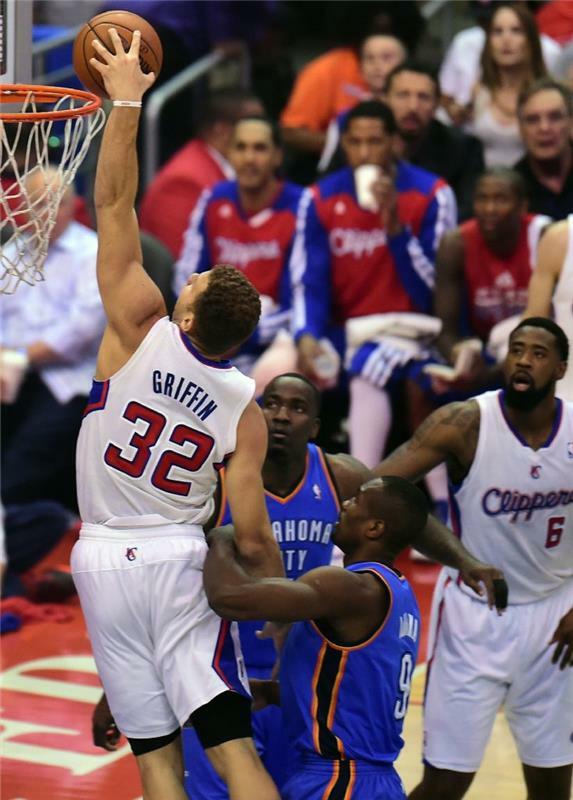 Blake Griffin gets past Reggie Jackson. Durant with another 3-pointer to cut the Clippers lead to 5, 41-36. He's 3-for-4 from that range tonight. And there's another 3 for KD, his third. Thunder pulls to within 5. OKC on 13-2 run. Here comes Kevin Durant. His three straight makes turn it into a five point game. Maybe these two teams should just start even in the fourth quarter. They're incredibly even. Reddick hits a three-pointer to get the crowd back in the game. Blake Griffin hits J.J. Redick in the corner for a three - Clippers needed that . . .
Fisher with back-to-back air balls? Why you gotta foul Blake on that dunk and mess up a potential Sports Center highlight. Sheesh. DeAndre has not shot FT well this series - just split a pair. DJ just scored for the first time in two games. (He was scoreless in Game 5). Fisher has gone very cold, his shots are suddenly missing by feet rather than inches. Griffin hard to the basket and draws the foul on Ibaka. He makes one of two, but Adams called for a foul on the second shot and DeAndre goes to the line.... Klunk, make. LAC, 46-36.